Sensitization and challenge using dinitrofluorobenzene (DNFB) induce contact hypersensitivity (CHS) with Th1 cell infiltration, whereas those using FITC generate CHS with Th2 cell infiltration. In this study, we attempted to determine the role of CXCR3, a chemokine receptor, in Th1- and Th2-type CHS induced by DNFB or FITC using CXCR3-deficient (CXCR3−/−) mice. Ear swelling was prolonged after DNFB challenge in CXCR3−/− mice, which was accompanied by increased Th1 cytokines and decreased TGF-β and IL-10 expression at a late time point of CHS, whereas there was no significant difference between wild-type and CXCR3−/− mice in FITC-induced CHS. In Th1-type CHS, the number of regulatory T cells (Tregs) was decreased in the challenged ear of CXCR3−/− mice compared with that of wild-type mice, suggesting that CXCR3 would be important in migration of Tregs into the site of inflammation. Moreover, we examined the characteristics of CXCR3+ Tregs both in vitro and in vivo, revealing that CXCR3+ Tregs expressed high levels of TGF-β and IL-10 as well as IFN-γ compared with CXCR3− Tregs. When CXCR3−/− mice were injected with CXCR3+ Tregs, the prolonged ear swelling induced by DNFB was normalized. Taken together, our results suggest that CXCR3+ Tregs play a key role for quenching Th1-type CHS. Contact hypersensitivity (CHS) is an immunological response against a small chemical hapten. During the sensitization phase, dermal dendritic cells (DCs) and Langerhans cells take up the hapten peptide conjugate and process it and migrate to the draining lymph node (1), where they present the Ag to naive T cells, leading to the formation of Ag-specific memory T cells. Subsequent contact with the same chemical results in the activation of memory T cells and the recruitment of inflammatory cells to the site of allergen exposure. This elicitation response is manifested as skin inflammation, which in a clinical context is called allergic contact dermatitis (2). One of small chemical haptens is dinitrofluorobenzene (DNFB), which is associated with the activation of Th1 cells. Upon challenging the skin with DNFB in mice sensitized with DNFB, DNFB-specific T cells are recruited to the skin and produce Th1 cytokines, including IFN-γ and IL-2 after challenge, indicating that Th1 cells are important in DNFB-induced CHS response (3). In contrast, previous studies have shown that FITC-induced CHS is Th2 dominant (3–6). When FITC was used as a hapten, Th2-like response was observed with an IL-4/IFN-γ ratio of 25, whereas more IFN-γ than IL-4–secreting cells were found in draining lymph nodes from DNFB-sensitized mice with an IL-4/IFN-γ ratio of 0.026 (4). Thus, DNFB induces Th1-type CHS, whereas FITC induces Th2-type CHS. CD4+CD25+ regulatory T cells (Tregs), which are critical for the development and maintenance of self-tolerance, are considered to have potential for suppressing unwanted tissue destruction in autoimmune disease, transplantation, and graft-versus-host disease (GVHD) (7–9). These cells express a specific transcription factor Foxp3, which has been associated with their development and suppressive function in both mice and humans (7–9). Tregs use multiple mechanisms to suppress effector cell expansion such as cell–cell contact-dependent suppression and secretion of immunosuppressive cytokines, including TGF-β, IL-10, and IL-35 (10–14). Several studies have shown that Foxp3+ Tregs are not a homogeneous population (15–18). There are emerging data suggesting that some Treg populations, retaining expression of Foxp3, express transcription factors and chemokine receptors that are characteristic of either Th1 cells such as T-box–containing protein expressed in T lymphocytes (T-bet) and CXCR3 or Th2 cells such as IFN regulatory factor 4 and CCR8 (19, 20). CXCR3 is preferentially expressed on Th1 cells and critically involved in their recruitment to inflamed tissues (21–23). Consistent with this, the expression of CXCR3 and its chemokine ligands, monokine induced by IFN-γ (or CXCL9), IFN-γ–inducible protein of 10 kDa (or CXCL10), and IFN-γ–inducible T cell α-chemoattractant (CXCL11), has been reported to be associated with various autoimmune diseases and both cardiac and renal allograft rejection (23–25). Accordingly, CXCR3-deficient (CXCR3−/−) mice showed reduced trafficking of effector T cells into the kidney, resulting in less renal injury in a mouse nephrotoxic nephritis model (26). However, studies using CXCR3−/− mice generated controversial results relating to disease severity in experimental autoimmune encephalomyelitis (EAE) and mouse immune-mediated hepatitis (24, 27). Therefore, CXCR3+ T cells might exert either protective or deleterious functions, depending on the models of immune responses. In this study, we analyzed the contribution of CXCR3 to Th1-type CHS induced by DNFB and to Th2-type CHS induced by FITC, using CXCR3−/− mice. In Th1-type CHS, ear swelling of CXCR3−/− mice was prolonged compared with wild-type mice, whereas there was no significant difference between CXCR3−/− and wild-type mice in Th2-type CHS. 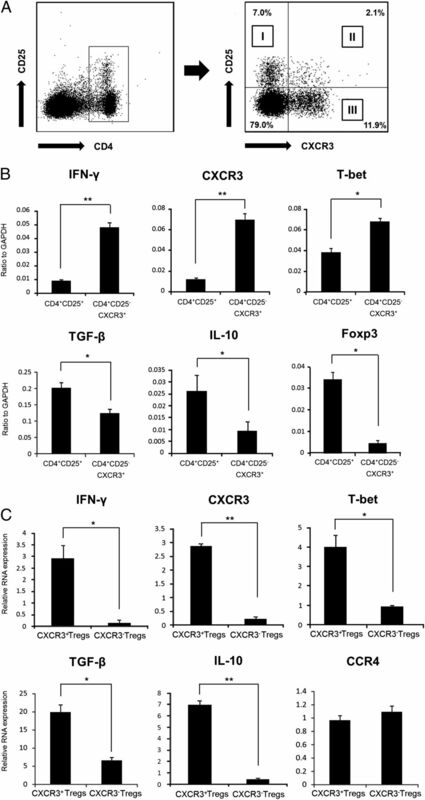 DNFB-challenged ear of CXCR3−/− mice exhibited increased expression of Th1 cytokines and decreased expression of TGF-β and IL-10 together with decreased numbers of Tregs at a late time point compared with that of wild-type mice. Moreover, injection of CXCR3+ Tregs into CXCR3−/− mice abrogated the prolonged ear swelling induced by DNFB. Our study suggests that CXCR3+ Tregs play a key role for quenching Th1-type CHS. CXCR3−/− mice with C57BL/6 background had been established by gene targeting, as described elsewhere (28). CXCR3−/− mice and C57BL/6 mice were obtained from The Jackson Laboratory (Bar Harbor, ME). All mice used were 8–14 wk old. They were healthy, fertile, and did not display evidence of infection or disease. All animal experiments were approved by the Animal Research Committee of the University of Tokyo. CHS responses were induced either with DNFB (Sigma-Aldrich, St. Louis, MO) or FITC (Sigma-Aldrich), as previously described (29). Briefly, a volume of 50 μl 0.5% DNFB, in acetone and olive oil (4:1), was painted onto shaved abdominal skin on days 0 and 1. A volume of 20 μl 0.5% DNFB was also painted onto foot for consecutive 2 d. CHS was elicited by applying 0.25% DNFB on the right ear on day 6. CHS responses to FITC were induced by applying 0.5% FITC, in acetone and dibutylphthalate (1:1), onto shaved abdominal skin. After 5 d, CHS reactions were elicited by applying 0.5% FITC solution. For all CHS experiments, baseline ear thickness was determined with a spring-loaded caliper. Ear-swelling responses were measured before elicitation and at 6, 12, 24, 36, 48, 72, 96, 120, 144, and 168 h after elicitation. The changes in ear thickness from baseline measurement were computed. Each ear was measured three times by a researcher who was blind to the results, and the mean of these values was used. The degree of CHS was determined as the swelling of the hapten-challenged ear compared with that of the vehicle-treated ear. Unsensitized mice were also challenged with haptens to assess the innate inflammatory responses. A central strip of the ear was fixed in 10% formalin and then paraffin embedded. Sections, 6 μm thick, were stained using H&E for general histological evaluation and toluidine blue for mast cell staining. Dermal leukocyte infiltration was evaluated by averaging the number of leukocytes that was counted in 10 random grids under high original magnification (×400) power fields of a light microscope. Each section was examined independently by two investigators in a blinded manner. For immunohistochemistry, frozen tissue sections of skin biopsies were acetone fixed and then incubated with 10% normal rabbit serum in PBS (10 min at 37°C) to block nonspecific staining. Sections were then incubated with rat mAbs specific for mouse macrophages (F4/80; Serotec, Oxford, U.K.), CD4 (clone RM4-5; BD Pharmingen, San Diego, CA), and CD8 (clone 53-6.7; BD Pharmingen). Rat IgG (Southern Biotechnology Associates, Birmingham, AL) was used as a control. Sections were sequentially incubated sequentially (20 min at 37°C) with biotinylated rabbit anti-rat IgG (Vectastain ABC kit; Vector Laboratories, Burlingame, CA) and then HRP-conjugated avidin–biotin complexes. Diaminobenzidine was used for visualizing the staining, and counterstaining with Mayer hematoxylin was performed, according to the manufacturers’ instructions. Stained cells were counted in 10 random grids under high original magnification (×400) power fields of a light microscope. Each section was examined independently by two investigators in a blinded manner. RNA was obtained from the ears or spleen cells with RNeasy Fibrous Tissue Mini Kit (Qiagen, Valencia, CA). cDNA was synthesized using iScript cDNA Synthesis Kit (Bio-Rad Laboratories, Berkeley, CA). Quantitative RT-PCR was performed, as described previously (30). Primers for mouse IFN-γ, CXCL9, CXCL10, TGF-β, IL-10, Foxp3, CXCR3, T-bet, CCR4, and GAPDH were as follows: IFN-γ forward, 5′-AGC AAC AGC AAG GCG AAA A-3′ and reverse, 5′-CTG GAC CTG TGG GTT GTT GA-3′; CXCL9 forward, 5′-TGG GCA TCA TCT TCC TGG AG-3′ and reverse, 5′-CCG GAT CTA GGC AGG TTT GA-3′; CXCL10 forward, 5′-CCC ACG TGT TGA GAT CAT TG-3′ and reverse, 5′-CAC TGG GTA AAG GGG AGT GA-3′; TGF-β forward, 5′-TTG CTT CAG CTC CAC AGA GA-3′ and reverse, 5′-TGG TTG TAG AGG GCA AGG AC-3′; IL-10 forward, 5′-TTT GAA TTC CCT GGG TGA GAA-3′ and reverse, 5′-ACA GGG GAG AAA TCG ATG ACA-3′; Foxp3 forward, 5′-TAC TTC AAG TTC CAC AAC ATG CGA CC-3′ and reverse, 5′-CGC ACA AAG CAC TTG TGC AGA CTC AG-3′; CXCR3 forward, 5′-AGA ATC ATC CTG GTC TGA GAC AA-3′ and reverse, 5′-AAG ATA GGG CAT GGC AGC TA-3′; T-bet forward, 5′-GGA CAC CTC GGG AAC ACA GT-3′ and reverse, 5′-TCA TGC TCA CAG CTC GGA ACT-3′; CCR4 forward, 5′-TCT ACA GCG GCA TCT TCT TCA T-3′ and reverse, 5′-CAG TAC GTG TGG TTG TGC TGT G-3′; GAPDH forward, 5′-ACC CAC TCC TCC ACC TTT GA-3′ and reverse, 5′-CAT ACC AGG AAA TGA GCT TGA CAA-3′. Specific primer for IL-17A, IL-17F, and IL-22 was purchased from Applied Biosystems (Foster City, CA). Inguinal lymph nodes in wild-type or CXCR3−/− mice were harvested 5 d after DNFB sensitization. CD8+ T cells were purified using CD8a+ T Cell Isolation Kit II (mouse) (Miltenyi Biotec, Auburn, CA). DCs were harvested from spleen in naive wild-type mice using CD11c (N418) MicroBeads (Miltenyi Biotec). A total of 5 × 105 purified CD8+ T cells and 1 × 105 purified CD11c+ DCs was cocultured for 2 d in 200 μl 0.4 mM dinitrobenzene sulfonic acid (DNBS) or medium only. Brefeldin A (10 μg/ml; Sigma-Aldrich, St. Louis, MO), ionomycin (2 μg/ml; Sigma-Aldrich), and PMA (25 ng/ml; Sigma-Aldrich) were added at the last 4 h of incubation for intracellular cytokine FACS staining. Abs used in this study included allophycocyanin-conjugated mAb against CD8 (BioLegend, San Diego, CA), PE-conjugated mAb against CCR4 (BioLegend), and PE-conjugated mAb against CCR10 (R&D Systems, Minneapolis, MN). For intracellular cytokine staining, we used FITC-conjugated mAb against IFN-γ (BioLegend). The positive and negative population of cells was determined using unreactive isotype-matched Abs (Southern Biotechnology Associates) as controls for background staining. Inguinal lymph nodes in wild-type mice were harvested 5 d after DNFB sensitization, and cells were stained with CellTrace CFSE Cell Proliferation Kit (Molecular Probes, Eugene, OR). A mixture of 4 × 106 cells in 200 μl PBS was adoptively transferred i.v. into naive wild-type and CXCR3−/− mice. After 24 h, 0.25% DNFB was applied onto the ear. Ear samples were harvested 24 and 120 h after challenge, and skin sheets were incubated in PBS containing 0.5% trypsin (U.S. Biochemical, Cleveland, OH) for 40 min at 37°C with dermal side down to separate epidermal sheets from dermal sheets. To obtain cell suspensions, dermal sheets were incubated in 10 ml RPMI 1640 containing 15 mg collagenase D (Roche, Indianapolis, IN), 0.01% DNase I (Sigma-Aldrich), and 10% FBS for 45 min at 37°C, as described (31). Cells were then filtered through a 70-μm nylon mesh and stained with allophycocyanin-conjugated mAb against CD8 (BioLegend). The frequencies of tissue-infiltrating CD8+ T cells and CFSE+CD8+ T cells were calculated. Ear samples were snap frozen, cut into 5-μm–thick cryostat sections, and fixed in acetone. These sections were then stained with FITC-conjugated anti-Foxp3 mAb (eBioscience, San Diego, CA) and PE-conjugated anti-CXCR3 mAb (R&D Systems). Slides were then mounted in Vectashield mounting medium with DAPI (Vector Laboratories). The numbers of dermal CXCR3+ Foxp3+, CXCR3− Foxp3+, and CXCR3+ Foxp3− cells were counted. Stained cells were counted in 10 random grids under high original magnification (×400) power fields of a light microscope. Each section was examined independently by two investigators in a blinded manner. Cervical lymph nodes and spleen were harvested before elicitation and 24, 72, and 120 h after elicitation. Single-cell suspensions were stained for three-color immunofluorescence analysis. Abs used in this study included PE-conjugated anti-CXCR3 mAb (R&D Systems), PerCP-Cy5.5–conjugated anti-CD4 mAb (BD Pharmingen), and FITC-conjugated anti-Foxp3 mAb (eBioscience). First, we incubated single-cell suspensions with the PE-conjugated anti-CXCR3 mAb and PerCP-Cy5.5–conjugated anti-CD4 mAb for 20 min at 4°C. Then we stained for intracellular Foxp3 with anti-Foxp3 staining set FITC (eBioscience), according to the manufacturer’s instructions. Cells were washed and analyzed on a FACScan flow cytometer (BD Pharmingen). The positive and negative population of cells was determined using unreactive isotype-matched Abs (Southern Biotechnology, Birmingham, AL) as controls for background staining. To separate three distinct cell populations, CD4+CD25+CXCR3+, CD4+CD25+CXCR3−, and CD4+CD25−CXCR3+, from spleen of nonsensitized wild-type mice, we used FACSAria cell sorter (BD Biosciences, San Jose, CA). Abs included in this sorting were PE-conjugated anti-CXCR3 mAb (R&D Systems), PerCP-Cy5.5–conjugated anti-CD25 mAb (BD Pharmingen), and FITC-conjugated anti-CD4 mAb (BD Pharmingen). We used nonsensitized wild-type mice as donor mice. CD4+CD25+CXCR3+ (CXCR3+ Treg) and CD4+CD25+CXCR3− (CXCR3− Treg) spleen cells were harvested from spleen of nonsensitized wild-type mice, as described above, and a mixture of 1 × 105 cells in 200 μl PBS was i.v. injected into DNFB-sensitized CXCR3−/− mice. After 24 h, mice were elicited with 0.25% DNFB, and ear-swelling responses were measured at the indicated time, as described above. All data are shown as mean values ± SEM. Statistical analysis between two groups was performed using the Mann–Whitney U test. To assess a role of CXCR3 in Th1-type and Th2-type CHS responses, wild-type and CXCR3−/− mice were challenged with DNFB or FITC after sensitization, and ear swelling was measured before and after challenge. Ear thickness of untreated mice and vehicle-treated mice was similar between wild-type and CXCR3−/− mice (Fig. 1A and data not shown). In wild-type mice, ear swelling reached a peak at 36 h after DNFB challenge, and then gradually decreased (Fig. 1A). In contrast, ear swelling was prolonged in CXCR3−/− mice, resulting in a significant increase in ear swelling 72, 96, 120, 144, and 168 h after elicitation compared with that in wild-type mice (p < 0.05 each). In contrast, wild-type and CXCR3−/− mice showed similar ear swelling after FITC elicitation (Fig. 1B). Thus, recovery from Th1-type, but not Th2-type, CHS was delayed in CXCR3−/− mice. Recovery from DNFB-induced CHS is delayed in CXCR3−/− mice. Mice were sensitized with 0.5% DNFB (A) or 0.5% FITC (B) for consecutive 2 d. Five days later, CHS was elicited by 0.25% DNFB (A) or 0.5% FITC (B) on the right ear. Ear thickness was measured from the time of challenge to 168 h postchallenge. The degree of CHS was expressed as the degree of swelling of the hapten-challenged ear when compared with that of the vehicle-treated ear (mean ± SEM). Unsensitized mice were also challenged with haptens to assess the innate inflammatory responses. Significant differences were detected in the mean CHS responses between CXCR3−/− mice and wild-type mice at 72, 96, 120, 144, and 168 h after elicitation with DNFB (A), but not with FITC (B). Six mice were used per condition. *p < 0.05. We also evaluated CHS responses histopathologically. There was no difference between ears from wild-type and CXCR3−/− mice before elicitation with DNFB (Fig. 2A). Dermal edema and numerous infiltrate in the dermis that were detected 24 h after challenge with DNFB were similar between these mice. In wild-type mice, dermal edema disappeared with only a small number of dermal infiltrate 120 h after elicitation. In contrast, the dermis was still thick with many inflammatory cells remaining in the ear of CXCR3−/− mice at that time. We next stained the sections with toluidine blue or mAbs against F4/80, CD4, and CD8, and counted the numbers of positive cells. Before elicitation, there were no significant differences in the numbers of eosinophils, mast cells, CD4+ and CD8+ T cells, and macrophages between wild-type and CXCR3−/− mice (Fig. 2B). Twenty-four hours after elicitation, the numbers of these inflammatory cells increased to a similar extent in wild-type and CXCR3−/− mice. 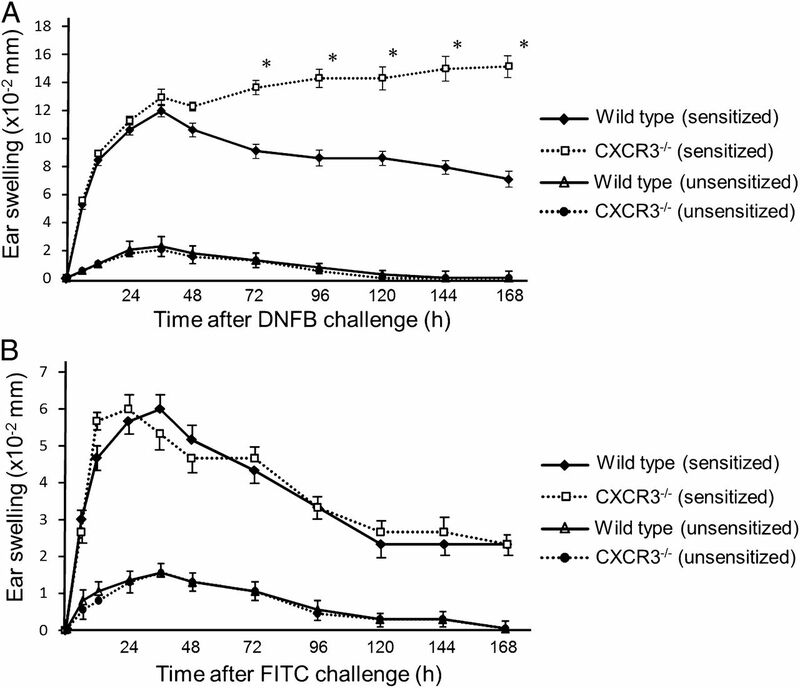 They decreased 120 h after DNFB challenge in wild-type mice. Although the numbers of inflammatory cells 120 h after challenge also significantly decreased in CXCR3−/− mice compared with those 24 h after challenge, they were significantly larger in CXCR3−/− mice than in wild-type mice (p < 0.05; Fig. 2B). In FITC-induced CHS, dermal edema and numerous infiltrates in the dermis were detected 24 h after challenge in both mice (Fig. 2A). The numbers of inflammatory cells decreased 120 h after FITC challenge, and there was no difference in the numbers of infiltrates between wild-type and CXCR3−/− mice at any time point (Fig. 2B). Thus, more inflammatory cells infiltrated into the skin at a late time point of Th1-type CHS in CXCR3−/− mice. More inflammatory cells infiltrate into the skin at late time points of DNFB-induced CHS in CXCR3−/− mice. (A) Histopathology of CHS-elicited ear pinnae in wild-type and CXCR3−/− mice. Ear samples were taken before and 24 and 120 h after DNFB or FITC challenge and fixed in 4% formalin for routine histology with H&E staining (original magnification ×400; scale bars, 100 μm). Representatives of three mice in each condition. (B) The numbers of eosinophils, mast cells, CD4+ T cells, CD8+ T cells, and macrophages per HPF (original magnification ×400) in the ears from wild-type (WT) and CXCR3−/− mice were counted before and 24 and 120 h after DNFB or FITC challenge. *p < 0.05. We next examined cytokine expression in the ear before elicitation, and 24, 72, and 120 h after DNFB or FITC challenge (Fig. 3). Before elicitation, there was no significant difference in expression of these cytokines between wild-type and CXCR3−/− mice. In wild-type and CXCR3−/− mice, expression of these cytokines markedly increased to a similar extent 24 h after DNFB challenge (Fig. 3A). Expression of IFN-γ, CXCL9, and CXCL10, which decreased 72 and 120 h after elicitation, was significantly higher in CXCR3−/− mice than in wild-type mice at those times (p < 0.05). We also evaluated IL-17A, IL-17F, and IL-22 expression, which were reported to be induced by DNFB challenge (32, 33), revealing that IL-17F expression was significantly higher in CXCR3−/− mice than wild-type mice at 72 h (Fig. 3A). There was no significant difference in IL-17A and IL-22 expression between wild-type and CXCR3−/− mice at any time point (Fig. 3A and data not shown). In contrast, CXCR3−/− mice exhibited significantly lower TGF-β expression relative to wild-type mice 24 and 72 h after elicitation (p < 0.05). Similarly, IL-10 expression was significantly lower in CXCR3−/− mice than in wild-type mice 72 h after elicitation (p < 0.05). Moreover, CXCR3−/− mice showed significantly lower Foxp3 expression in the skin compared with wild-type mice 24 and 72 h after DNFB elicitation (p < 0.05), suggesting that Tregs were the main source of TGF-β and IL-10. In FITC-induced CHS, no significant difference was found in expression levels of these cytokines between wild-type and CXCR3−/− mice, which was consistent with the ear swelling (Fig. 3B). Thus, Th1 cytokine expression was increased and regulatory cytokine expression was decreased in the skin at a late time point of Th1-type CHS in CXCR3−/− mice. mRNA expression of Th1 cytokines is increased and that of Treg-related molecules is decreased in the DNFB-challenged ears from CXCR3−/− mice. Expression of IFN-γ, CXCL9, CXCL10, IL-17F, IL-22, TGF-β, IL-10, and Foxp3 mRNA in the ears from wild-type and CXCR3−/− mice before and 24, 72, and 120 h after DNFB (A) or FITC (B) challenge was examined by real-time RT-PCR. Six mice were used per condition. *p < 0.05. To elucidate the mechanism of delayed recovery from Th1-type CHS in CXCR3−/− mice, we first examined whether the priming of hapten-specific effector T cells was enhanced in CXCR3−/− mice. When CD8+ T cells from DNFB-sensitized mice were cultured with purified CD11c+ DCs in the presence of DNBS, there was no difference in the frequencies of IFN-γ–producing CD8+ T cells between wild-type and CXCR3−/− mice (Fig. 4A, 4B), suggesting that hapten-specific T cell priming in CXCR3−/− mice was comparable to that of wild-type mice. Whereas 15% of hapten-specific CD8+ T cells in wild-type mice expressed CXCR3 (data not shown), ∼10% of them expressed CCR4 and 1% expressed CCR10 in both wild-type and CXCR3−/− mice (Fig. 4C, 4D). As several previous studies have indicated that both CCR4 and CCR10 are markers for skin-homing T cells (34–36), these receptors may be used for the hapten-specific T cells in CXCR3−/− mice to migrate into the challenge site. Thus, hapten-specific T cell priming in CXCR3−/− mice was comparable to that of wild-type mice. Hapten-specific T cell priming in CXCR3−/− mice is comparable to that of wild-type mice. (A) CD8+ T cells from inguinal lymph nodes of DNFB-sensitized mice were cultured with purified CD11c+ DCs in the presence of DNBS, and they were stained with mAbs against CD8 and IFN-γ. (B) The frequencies of IFN-γ–producing CD8+ T cells among CD8+ T cells were not different between wild-type and CXCR3− mice. (C) Similar frequencies of DNFB-specific CD8+ T cells in wild-type and CXCR3−/− mice expressed CCR4. 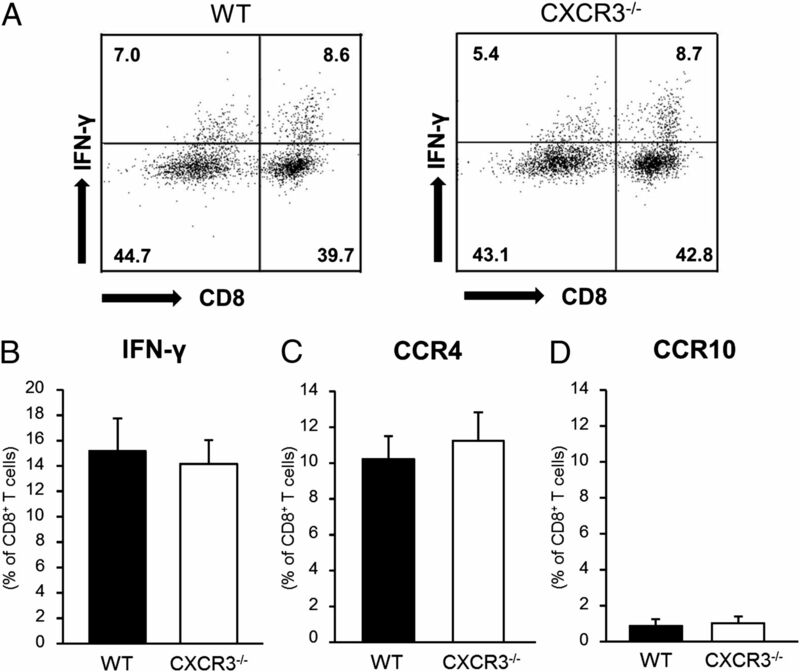 (D) CCR10 expression on DNFB-specific CD8+ T cells in wild-type and CXCR3−/− mice. Five mice were used per condition. We next investigated the effect of CXCR3 deficiency in the elicitation phase. To determine whether effector T cells were simply retained longer in the hapten-challenged tissue or underwent continual recruitment in CXCR3−/− mice compared with wild-type mice, we adoptively transferred CFSE-labeled cells from lymph nodes of DNFB-sensitized mice into wild-type or CXCR3−/− mice and examined the number of tissue-infiltrating CD8+ T cells in the challenged site where DNFB was painted 24 h after the i.v. transfer. The number of CD8+ T cells in the challenged ear of CXCR3−/− mice was almost the same as that of wild-type mice 24 h after challenge, whereas the number was significantly larger than that of wild-type mice 120 h after challenge (Fig. 5A). The numbers of CFSE+CD8+ T cells 24 h after challenge were not significantly different between wild-type and CXCR3−/− mice (Fig. 5B). By contrast, the number of CFSE+CD8+ T cells in CXCR3−/− mice was significantly larger than that of wild-type mice 120 h after challenge. These results suggest that effector T cells retained longer in the hapten-challenged tissue probably because they were more proliferative or protected from apoptosis in the settings of CXCR3 deficiency. CXCR3 deficiency attenuates migration of Tregs into the challenged ear. (A) The frequencies of CD8+ T cells infiltrating into the ear 24 and 120 h after challenge in wild-type and CXCR3−/− mice. (B) The frequencies of CFSE+CD8+ T cells in the elicited ear 24 and 120 h after challenge in wild-type and CXCR3−/− mice. (C) Ears were stained with FITC-conjugated anti-Foxp3 mAb (original magnification ×400). Foxp3 (green; white arrows) and cell nucleus (blue). Representatives of three mice in each condition. (D) The numbers of Foxp3+ Tregs per HPF in the dermis of the ears from wild-type (WT) and CXCR3−/− mice 72 and 120 h after DNFB elicitation were counted. (E) Ears were stained with FITC-conjugated anti-Foxp3 mAb and PE-conjugated anti-CXCR3 mAb (original magnification ×400). Foxp3 (green) and CXCR3 (red). CXCR3+ Foxp3+ (white arrows), CXCR3− Foxp3+ (green triangles), and CXCR3+ Foxp3− cells (red triangles). Higher magnification of a CXCR3+ Foxp3+ cell was shown in the inset in the top left panel in (E). Representatives of three mice in each condition. (F) The numbers of CXCR3+ Foxp3+, CXCR3− Foxp3+, and CXCR3+ Foxp3− cells per HPF in the dermis of the ears from WT and CXCR3−/− mice 72 h after DNFB elicitation were counted. Six mice were used per condition. *p < 0.05. Retention of effector T cells in the challenged site (Fig. 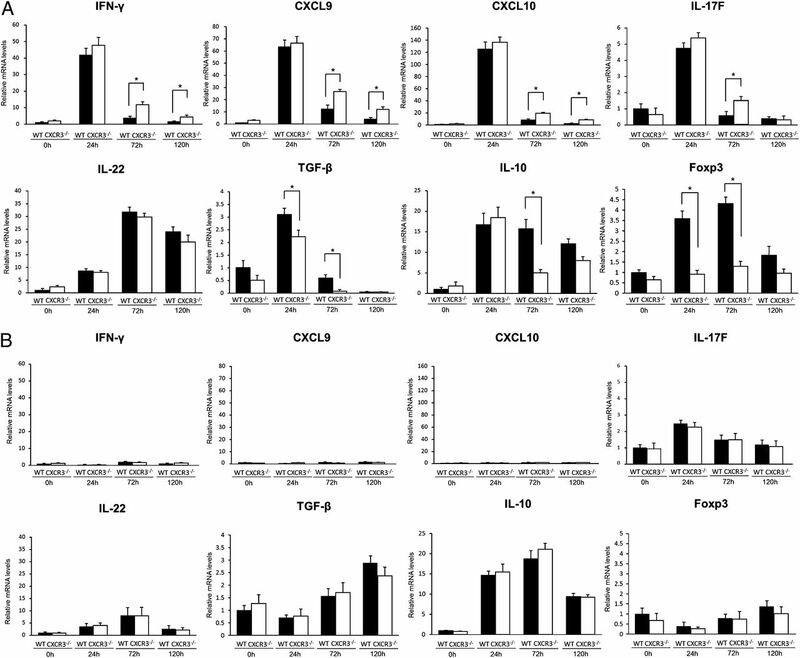 5B) as well as high expression levels of Th1 cytokines and low expression levels of TGF-β and IL-10 in CXCR3−/− mice (Fig. 3A) prompted us to hypothesize that infiltration of Tregs was decreased in those mice, which was consistent with significantly lower Foxp3 expression in the skin compared with wild-type mice 24 and 72 h after DNFB elicitation (p < 0.05; Fig. 3A). To test this hypothesis, we stained the ears 72 and 120 h after DNFB challenge for Foxp3 (Fig. 5C, 5D). The number of Foxp3+ cells in the ear of wild-type mice 72 h after elicitation was 20.9 ± 5.9 (mean ± SD) counts/high power field (HPF), which was significantly larger than that in the ear of CXCR3−/− mice (8.9 ± 2.8 counts/HPF; p < 0.05). In contrast, the ears of wild-type and CXCR3−/− mice exhibited similar numbers of Foxp3+ cells 120 h after elicitation (11.3 ± 4.3 counts/HPF and 10.9 ± 5.4 counts/HPF, respectively). We next stained the ears 72 h after DNFB challenge for both Foxp3 and CXCR3 (Fig. 5E, 5F). The ear of wild-type mice 72 h after elicitation showed the infiltration of CXCR3+ Foxp3+ cells (7.4 ± 0.5 counts/HPF) that were not detected in the ear of CXCR3−/− mice. The numbers of Foxp3+ cells lacking CXCR3 expression in the ear of wild-type and CXCR3−/− mice were similar (10.1 ± 1.4 counts/HPF and 11.0 ± 1.4 counts/HPF, respectively). The number of CXCR3+ Foxp3− cells, which were effector T cells, in the ear of wild-type mice was 7.4 ± 0.9 counts/HPF, whereas such cells were not detected in the ear of CXCR3−/− mice. Thus, decreased numbers of Tregs, including CXCR3+ Tregs, were detected in the ear of CXCR3−/− mice compared with wild-type mice 72 h after DNFB challenge, which may explain decreased expression of TGF-β and IL-10 and increased expression of Th1 cytokines. It has been recently reported that some Treg population expresses CXCR3, playing important roles for inducing tolerance in Th1 cell–mediated inflammation such as GVHD and immune-mediated hepatitis (9, 27, 37). We next examined the frequencies and function of CXCR3+ Tregs and CXCR3− Tregs during CHS responses. Spleen and draining cervical lymph nodes were harvested before elicitation, and 24, 72, and 120 h after DNFB challenge from wild-type and CXCR3−/− mice. In spleen, the frequencies of CXCR3+ Tregs on CD4+ T cell gating in spleen of wild-type mice remained similar at 3.5–4.0% before elicitation, and 24, 72, and 120 h after challenge (Fig. 6A, 6B). There was no significant difference in the frequencies between the time points. In contrast, the frequencies of CXCR3− Tregs on CD4+ T cell gating in spleen increased from 6.6 ± 1.0% before elicitation to 14.4 ± 1.1% 120 h after challenge (Fig. 6B). In CXCR3−/− mice, the frequencies of those cells also increased from 6.7 ± 0.6% to 11.3 ± 0.8% (Fig. 6B). Thus, CXCR3− Tregs slightly expanded in spleen of both wild-type and CXCR3−/− mice during CHS. In lymph nodes of wild-type mice, there were very few CXCR3+ Tregs detected at any time point described above (Fig. 6C, 6D). The frequencies of CXCR3− Tregs on CD4+ T cell gating in cervical lymph nodes of both wild-type and CXCR3− mice were similar before elicitation, and 24, 72, and 120 h after challenge (Fig. 6D). Thus, CXCR3+ Tregs mainly resided in spleen, but not in lymph nodes, and their frequencies did not change during CHS responses. CXCR3+ Tregs mainly reside in spleen, but not in lymph nodes. (A) Freshly isolated spleen cells from wild-type and CXCR3−/− mice before elicitation were stained with mAbs against Foxp3 and CXCR3. 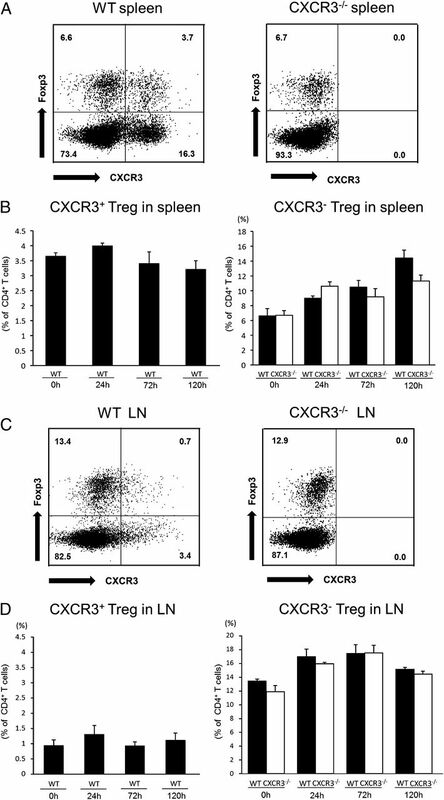 (B) The frequencies of CXCR3+ Tregs on CD4+ T cell gating in spleen from wild-type mice do not change during CHS responses, whereas CXCR3− Tregs slightly expand in spleen of both wild-type and CXCR3−/− mice. (C) Freshly isolated cells from cervical lymph nodes of wild-type and CXCR3−/− mice before elicitation were stained with mAbs against Foxp3 and CXCR3. (D) There were very few CXCR3+ Tregs detected at any time point. In lymph nodes of wild-type and CXCR3−/− mice, the frequencies of CXCR3− Tregs on CD4+ T cell gating do not change during CHS responses. Six mice were used per condition. We next harvested CD4+CD25+CXCR3+, CD4+CD25+CXCR3−, and CD4+CD25−CXCR3+ populations from spleen of nonsensitized wild-type mice by FACSAria cell sorter (Fig. 7A). We evaluated expression of cytokines, chemokine receptors, and transcription factors characteristic to Th1 cells and Tregs. We first compared between CD4+CD25+ and CD4+CD25−CXCR3+ populations. Expression levels of IFN-γ, CXCR3, and T-bet by CD4+CD25−CXCR3+ cells were significantly higher than those of CD4+CD25+ cells (Fig. 7B; p < 0.01, p < 0.01, and p < 0.05, respectively), whereas CD4+CD25+ cells showed a significantly higher expression of TGF-β, IL-10, and Foxp3 than CD4+CD25−CXCR3+ cells (Fig. 7B; p < 0.05 for each comparison), which was consistent with previous reports (10–13, 19). We next compared between CD4+CD25+CXCR3+ (CXCR3+ Treg) and CD4+CD25+CXCR3− (CXCR3− Treg) populations. We evaluated expression of cytokines, chemokine receptors, and transcription factors divided by Foxp3 expression levels. In CXCR3+ Tregs, expression levels of TGF-β and IL-10 as well as IFN-γ, CXCR3, and T-bet were significantly higher than CXCR3− Tregs (Fig. 7C; p < 0.05, p < 0.01, p < 0.05, p < 0.01, and p < 0.05, respectively). As for CCR4 expression, there was no significant difference between CXCR3+ Tregs and CXCR3− Tregs. Thus, CXCR3+ Tregs expressed not only Th1 markers, but also high levels of TGF-β and IL-10 compared with CXCR3− Tregs. CXCR3+ Tregs show higher expression of IL-10 and TGF-β as well as IFN-γ than CXCR3− Tregs. (A) Freshly isolated spleen cells from nonsensitized wild-type mice were stained with mAbs to CD4, CD25, and CXCR3. After gating on CD4+ T cells, CD4+CD25+CXCR3− cells (labeled I), CD4+CD25+CXCR3+ cells (labeled II), and CD4+CD25−CXCR3+ cells (labeled III) were harvested. (B) Expression of IFN-γ, CXCR3, T-bet, TGF-β, IL-10, and Foxp3 mRNA in CD4+CD25+ cells (I and II) and CD4+CD25−CXCR3+ cells (III). (C) Expression of IFN-γ, CXCR3, T-bet, TGF-β, IL-10, and CCR4 mRNA in CXCR3+ Tregs (II) and CXCR3− Tregs (I). Six mice were used per condition. *p < 0.05, **p < 0.01. To further clarify functions of CXCR3+ Tregs, we i.v. 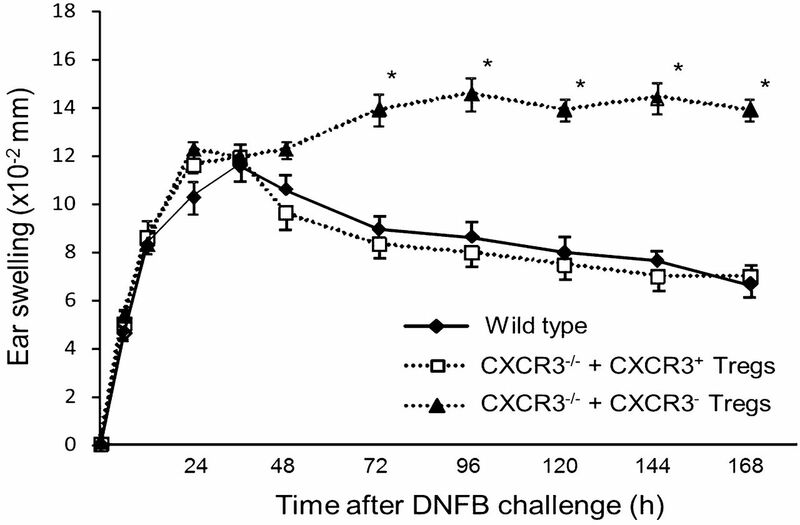 injected CXCR3+ Tregs or CXCR3− Tregs from naive wild-type mice into DNFB-sensitized CXCR3−/− mice 24 h prior to DNFB challenge to evaluate whether CXCR3+ Tregs could suppress Th1-type responses in vivo. In CXCR3−/− mice injected with CXCR3+ Tregs, ear swelling reached a peak 36 h after DNFB challenge, and then gradually decreased, which was comparable to wild-type mice (Fig. 8). In contrast, ear swelling was prolonged in CXCR3−/− mice injected with CXCR3− Tregs, resulting in a significant increase in ear swelling 72, 96, 120, 144, and 168 h after elicitation compared with that in wild-type or CXCR3−/− mice injected with CXCR3+ Tregs (p < 0.05 each). Thus, CXCR3+ Tregs, but not CXCR3− Tregs, normalized recovery from Th1-type responses in vivo. CXCR3+ Tregs attenuate Th1-type responses. Mice were sensitized with 0.5% DNFB for consecutive 2 d. CXCR3+ Tregs or CXCR3− Tregs isolated from spleen of nonsensitized wild-type mice were transferred to CXCR3−/− mice 4 d later. Twenty-four hours after the transfer, CHS was elicited by 0.25% DNFB on the right ear. Ear thickness was measured from the time of challenge to 168 h postchallenge. Six mice were used per condition. *p < 0.05. In this study, we showed that Th1-type CHS induced by DNFB was prolonged in CXCR3−/− mice compared with wild-type mice, whereas there was no significant difference in Th2-type CHS induced by FITC. We detected increased expression of Th1 cytokines and decreased expression of TGF-β and IL-10 together with decreased numbers of Tregs at a late time point in the challenged ear of CXCR3−/− mice compared with that of wild-type mice. Moreover, we examined characteristics of CXCR3+ Tregs, revealing that they expressed higher levels of TGF-β and IL-10 as well as IFN-γ than CXCR3− Tregs. Furthermore, when CXCR3−/− mice were injected with CXCR3+ Tregs, the prolonged ear swelling induced by DNFB was normalized. Our results suggest that CXCR3+ Tregs play a key role for quenching Th1-type CHS. Mice lacking CXCL10, a ligand for CXCR3, showed impaired Th1-type CHS with decreased recruitment of activated cells into the skin (38), which led us to assume that Th1-type CHS would be impaired also in CXCR3−/− mice. We were surprised to have the finding that Th1-type CHS was not impaired in CXCR3−/− mice for 48 h after DNFB challenge. On the contrary, ear swelling at a late time point after the challenge was prolonged (Fig. 1A). Similar findings were reported in EAE, in which CXCR3−/− mice displayed no difference in incidence and severity of disease, but show reduced disease contraction (39). As emerging data have suggested that CXCR3 is expressed not only on effector T cells, but also on some population of CD4+CD25+ Tregs (19), we further investigated the role of CXCR3+ Tregs in Th1-type CHS. First, we have examined cytokine expression in the challenged ears from wild-type and CXCR3−/− mice. IFN-γ, CXCL9, and CXCL10 expression was increased in CXCR3−/− mice compared with wild-type mice both 72 and 120 h after DNFB challenge, whereas TGF-β and IL-10 expression was decreased in CXCR3−/− mice 72 h (Fig. 3A), reflecting prolonged Th1-type CHS in CXCR3−/− mice. In this study, ear swelling and Th1 cytokine expression were not attenuated in CXCR3−/− mice, which seemed to be inconsistent with previous studies showing importance of interactions between CXCR3 and its ligands, such as CXCL9 and CXCL10 in Th1-type CHS (40, 41). One possible explanation would be that interactions between other chemokines and their receptors, such as CCL17 and CCR4, might have played compensatory roles for recruiting inflammatory cells into the challenged site (Fig. 4C) (42, 43). Enhanced CHS was also reported in mice deficient in CCR4, which has a crucial function in CHS via Ag-mediated recruitment of skin-homing T cells (44). At the same time, CCR4 is important for the development and function of Tregs. The absence of CCR4 resulted in enhanced secondary immune response during allergic skin inflammation. Together with our results, it may be possible that more redundant system is applied in the development of inflammatory reactions, whereas suppression of immune responses depends largely on relatively smaller number of molecules without functional redundancy in case of CHS. Foxp3 mRNA expression in the ear was increased in wild-type mice compared with CXCR3−/− mice 24 and 72 h after challenge (Fig. 3A). Immunohistochemical staining showed increased numbers of Foxp3+ Tregs in the challenged ear from wild-type mice at 72 h (Fig. 5C, 5D). In contrast, there were no remarkable changes in the frequencies of CXCR3+ Tregs in cervical lymph nodes and spleen. These results suggested that, following activation, CXCR3+ Tregs migrated into the very sites of inflammation, not in the lymph nodes, and played a role for quenching immune responses. Consistent with this, we showed CXCR3+ Foxp3+ Tregs in the dermis of challenged ears from wild-type mice (Fig. 5E, 5F). In a mouse model of immune-mediated hepatitis, the frequencies of CXCR3+ Tregs were increased in the liver after the stimulation, but not in the spleen, portal lymph nodes, or blood (27). Conversely, in EAE, CXCR3−/− mice showed a reduction in the recruitment of Tregs into the spinal cord (39). It was also revealed that 30–40% of human CD4+ Tregs expressed CXCR3 and that CXCR3+ Tregs showed significantly greater chemotaxis toward CXCL10 than CXCR3− Tregs (45). Moreover, transfecting CD4+CD25+Foxp3+ cells with CXCR3 increased their accumulation in target organs, indicating these cells can be recruited to sites of inflammation in a manner similar to the effector cells (46). Thus, CXCR3+ Tregs migrate into the challenged site of skin, which is abundant in CXCL9 and CXCL10, playing roles in quenching Th1-type CHS responses. Next, we compared the characteristics of CXCR3+ Tregs with CXCR3− Tregs (Fig. 7C). CXCR3+ Tregs showed increased expression of T-bet, TGF-β, IL-10, and IFN-γ compared with CXCR3− Tregs. CXCR3 expression on Tregs has been shown to depend on T-bet, a transcription factor necessary and sufficient for Th1 differentiation, because T-bet–deficient mice completely lack CXCR3+ Foxp3+ Tregs (19). T-bet–deficient Tregs fail to migrate, proliferate, and accumulate in response to Th1 cues. High T-bet expression in CXCR3+ Tregs in our model was consistent with these previous findings. TGF-β and IL-10 expression was higher in CXCR3+ Tregs than CXCR3− Tregs. Both TGF-β and IL-10 are key cytokines mediating immune regulatory functions (10–13). Most Foxp3+T-bet+CXCR3+ Tregs were reported to express high levels of IL-10, which was consistent with our findings. In EAE, CXCR3−/− Tregs that did enter the spinal cord failed to cluster in CD3+ Foxp3− T cell areas, as was seen for wild-type Tregs, indicating that CXCR3 expression is required for Treg entry into peripheral tissues, and also their function and interaction with effector T cells in these sites (39). We showed high IFN-γ expression in CXCR3+ Tregs (Fig. 7C). IFN-γ produced by alloantigen-induced murine CD4+CD25+ Tregs has been found to be necessary for suppression of effector responses both in vitro and in vivo (47). In humans, Foxp3+ Tregs in the circulation of allogeneic kidney transplant recipients express IFN-γ, which are associated with good long-term graft (48). It is, however, still possible that IFN-γ signal detected in CXCR3+CD4+CD25+ population (Fig. 7C) came from potentially contaminated cells because Foxp3 can suppress IFN-γ expression (49), and only few Foxp3+T-bet+ cells from murine spleen were reported to produce IFN-γ (49). In a murine acute GVHD model, transfer of CXCR3-transfected Tregs ameliorated liver disease, due to more pronounced migration and prolonged persistence of CXCR3+ Tregs within the liver (37). In our study, prolonged ear swelling in CXCR3−/− mice was cured by transferring CXCR3+ Tregs isolated from wild-type mice (Fig. 8), probably because these Tregs migrated into the ear. Peripheral-homing Tregs also express further chemokine receptors, including CCR5 and CCR6 beside CXCR3, which might account for Treg recruitment into the inflamed sites (50–53). Treg migration may be compensated by these chemokine receptors in CXCR3−/− mice, which may explain no obvious developmental abnormalities in these mice (26). Interestingly, previous reports support the idea that T-bet–expressing Tregs specifically suppress Th1 inflammation, and not Th2- or Th17-driven inflammation, which have separately been shown to be suppressed by IFN regulatory factor 4-expressing and Stat3-expressing Tregs, respectively (20, 54). To be consistent, CXCR3−/− mice did not show any differences from wild-type mice in Th2-type CHS. Transferring specific Treg population that most efficiently suppresses each inflammatory disease would be an ideal therapy in the future. In summary, we showed the contribution of CXCR3 to Th1-type CHS induced by DNFB. Th1-type CHS was prolonged in CXCR3−/− mice, mainly because CXCR3+ Tregs were deficient in CXCR3−/− mice. CXCR3+ Tregs suppressed Th1 cytokine expression at a late time point in the elicitation phase, which was different from well-known suppressive functions of Tregs in the sensitization phase (55). Moreover, we examined the characteristics of CXCR3+ Tregs and revealed that they had a more potent immunoregulatory function than CXCR3− Tregs. Our results suggest that CXCR3+ Tregs play a key role for quenching Th1-type CHS. We thank Tamami Kaga and Kiyoko Nashiro for technical assistance. This work was supported by the Ministry of Education, Culture, Sports, Science and Technology in Japan.
. 2008. Insights into Langerhans cell function from Langerhans cell ablation models. Eur. J. Immunol. 38: 2369–2376.
. 2004. The role of CD4+ and CD8+ T cells in contact hypersensitivity and allergic contact dermatitis. Eur. J. Dermatol. 14: 131–138.
. 2004. Essential role of MHC II-independent CD4+ T cells, IL-4 and STAT6 in contact hypersensitivity induced by fluorescein isothiocyanate in the mouse. Int. Immunol. 16: 685–695.
. 1996. Suppression of murine allergic contact dermatitis by CTLA4Ig: tolerance induction of Th2 responses requires additional blockade of CD40-ligand. J. Immunol. 157: 117–125.
. 2000. Role of CD4(+) T helper 2-type cells in cutaneous inflammatory responses induced by fluorescein isothiocyanate. Immunology 101: 442–451.
. 2004. CRTH2 is a prominent effector in contact hypersensitivity-induced neutrophil inflammation. Int. Immunol. 16: 947–959.
. 1985. Organ-specific autoimmune diseases induced in mice by elimination of T cell subset. I. Evidence for the active participation of T cells in natural self-tolerance; deficit of a T cell subset as a possible cause of autoimmune disease. J. Exp. Med. 161: 72–87.
. 2005. Regulatory T cells, derived from naive CD4+CD25− T cells by in vitro Foxp3 gene transfer, can induce transplantation tolerance. Transplantation 79: 1310–1316.
. 2002. The infusion of ex vivo activated and expanded CD4(+)CD25(+) immune regulatory cells inhibits graft-versus-host disease lethality. Blood 99: 3493–3499.
. 2001. IL-10 is required for regulatory T cells to mediate tolerance to alloantigens in vivo. J. Immunol. 166: 3789–3796.
. 1999. An essential role for interleukin 10 in the function of regulatory T cells that inhibit intestinal inflammation. J. Exp. Med. 190: 995–1004.
. 2003. CD4+CD25+ T regulatory cells control anti-islet CD8+ T cells through TGF-beta-TGF-beta receptor interactions in type 1 diabetes. Proc. Natl. Acad. Sci. USA 100: 10878–10883.
. 2005. T cells that cannot respond to TGF-beta escape control by CD4(+)CD25(+) regulatory T cells. J. Exp. Med. 201: 737–746.
. 2007. The inhibitory cytokine IL-35 contributes to regulatory T-cell function. Nature 450: 566–569.
. 2009. Functional delineation and differentiation dynamics of human CD4+ T cells expressing the FoxP3 transcription factor. Immunity 30: 899–911.
. 2006. MHC class II expression identifies functionally distinct human regulatory T cells. J. Immunol. 176: 4622–4631.
. 2008. Two functional subsets of FOXP3+ regulatory T cells in human thymus and periphery. Immunity 28: 870–880.
. 2004. Developmental stage, phenotype, and migration distinguish naive- and effector/memory-like CD4+ regulatory T cells. J. Exp. Med. 199: 303–313.
. 2009. Regulatory T-cell suppressor program co-opts transcription factor IRF4 to control T(H)2 responses. Nature 458: 351–356. 1998. Chemokines and leukocyte traffic. Nature 392: 565–568.
. 2009. CXCR3, inflammation, and autoimmune diseases. Ann. N. Y. Acad. Sci. 1173: 310–317.
. 2001. Expression of the chemokine receptor CXCR3 and its ligand IP-10 during human cardiac allograft rejection. Circulation 104: 2558–2564.
. 2004. CXCR3 and CCR5 positive T-cell recruitment in acute human renal allograft rejection. Transplantation 78: 1341–1350.
. 2011. CXCR3 deficiency exacerbates liver disease and abrogates tolerance in a mouse model of immune-mediated hepatitis. J. Immunol. 186: 5284–5293.
. 2000. Requirement of the chemokine receptor CXCR3 for acute allograft rejection. J. Exp. Med. 192: 1515–1520.
. 2007. CD19 expression in B cells is important for suppression of contact hypersensitivity. Am. J. Pathol. 171: 560–570.
. 2012. Lymphatic dysfunction impairs antigen-specific immunization, but augments tissue swelling following contact with allergens. J. Invest. Dermatol. 132: 667–676.
. 1998. Identification and quantitation of interferon-gamma producing T cells in psoriatic lesions: localization to both CD4+ and CD8+ subsets. J. Invest. Dermatol. 111: 1072–1078.
. 2006. CD8+ IL-17-producing T cells are important in effector functions for the elicitation of contact hypersensitivity responses. J. Immunol. 177: 6852–6858.
. 2009. CD8 T cells producing IL-17 and IFN-gamma initiate the innate immune response required for responses to antigen skin challenge. J. Immunol. 182: 5949–5959.
. 2006. The vast majority of CLA+ T cells are resident in normal skin. J. Immunol. 176: 4431–4439.
. 2000. Cutting edge: the orphan chemokine receptor G protein-coupled receptor-2 (GPR-2, CCR10) binds the skin-associated chemokine CCL27 (CTACK/ALP/ILC). J. Immunol. 164: 3465–3470.
. 1999. 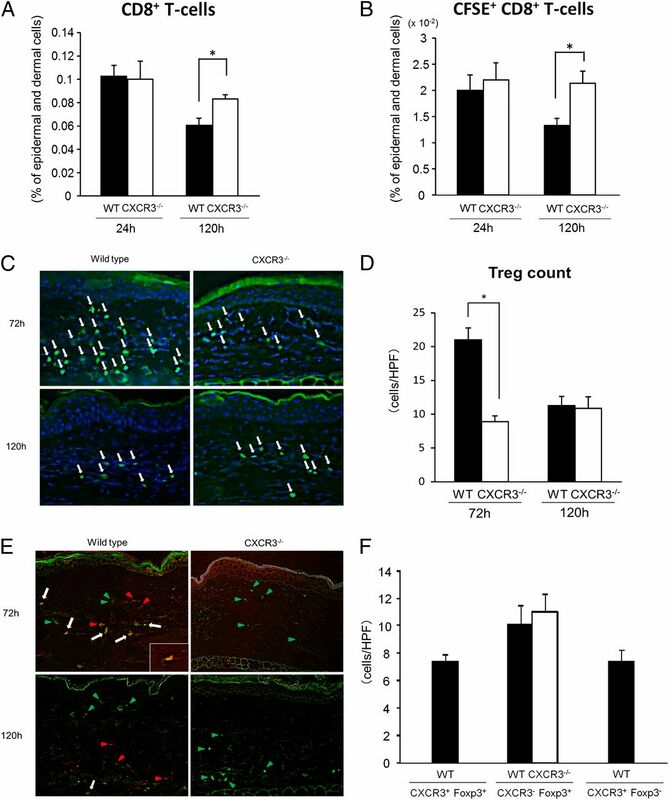 The chemokine receptor CCR4 in vascular recognition by cutaneous but not intestinal memory T cells. Nature 400: 776–780.
. 2002. IFN-gamma-inducible protein 10 (IP-10; CXCL10)-deficient mice reveal a role for IP-10 in effector T cell generation and trafficking. J. Immunol. 168: 3195–3204.
. 2007. CXCR3 signaling reduces the severity of experimental autoimmune encephalomyelitis by controlling the parenchymal distribution of effector and regulatory T cells in the central nervous system. J. Immunol. 179: 2774–2786.
. 2002. Dominant expression of CXCR3 is associated with induced expression of IP-10 at hapten-challenged sites of murine contact hypersensitivity: a possible role for interferon-gamma-producing CD8(+) T cells in IP-10 expression. J. Dermatol. Sci. 28: 234–241.
. 2008. Cutaneous hypersensitivities to hapten are controlled by IFN-gamma-upregulated keratinocyte Th1 chemokines and IFN-gamma-downregulated Langerhans cell Th2 chemokines. J. Invest. Dermatol. 128: 1719–1727.
. 2001. CC chemokine receptor (CCR)4 and the CCR10 ligand cutaneous T cell-attracting chemokine (CTACK) in lymphocyte trafficking to inflamed skin. J. Exp. Med. 194: 1541–1547.
. 2010. 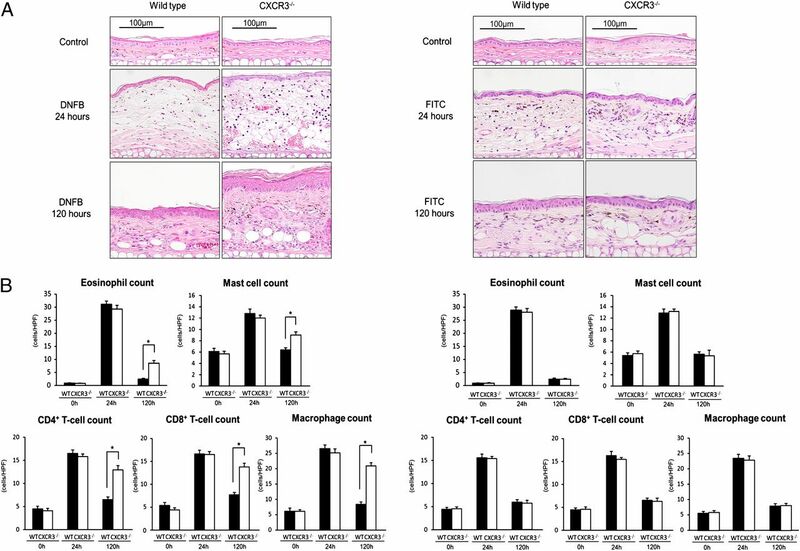 Absence of CCR4 exacerbates skin inflammation in an oxazolone-induced contact hypersensitivity model. J. Invest. Dermatol. 130: 2743–2751.
. 2011. Subsets of human CD4(+) regulatory T cells express the peripheral homing receptor CXCR3. Eur. J. Immunol. 41: 2291–2302.
. 2011. CXCR3 in T cell function. Exp. Cell Res. 317: 620–631.
. 2005. IFN-gamma production by alloantigen-reactive regulatory T cells is important for their regulatory function in vivo. J. Exp. Med. 201: 1925–1935.
. 2008. Observational support for an immunoregulatory role of CD3+CD4+CD25+IFN-gamma+ blood lymphocytes in kidney transplant recipients with good long-term graft outcome. Transpl. Int. 21: 646–660.
. 2005. Foxp3 interacts with nuclear factor of activated T cells and NF-kappa B to repress cytokine gene expression and effector functions of T helper cells. Proc. Natl. Acad. Sci. USA 102: 5138–5143.
. 2005. CD8+ T cells produce IL-2, which is required for CD(4+)CD25+ T cell regulation of effector CD8+ T cell development for contact hypersensitivity responses. J. Leukoc. Biol. 78: 725–735.